Penguin Books and NASA have very different ideas about celebrating the 30th anniversary of Hitchhiker's Guide to the Galaxy. NASA did it by having their LCROSS (Lunar Crater Observation and Sensing Satellite) vehicle tweeting lines from Hitchhiker’s, just before it slammed into the moon’s surface earlier this week. Penguin, on the other hand is marking this occasion in what's been argued by some as a controversial way by publishing a sixth volume in the ever-more increasingly inaccurately named Hitchhiker’s Guide to the Galaxy trilogy on Monday (12th October). This isn't, however, a lost Douglas Adams manuscript but an entirely new novel by internationally best selling author of the Artemis Fowl series, Eoin Colfer. Adams final book in the Hitchhiker’s series ended (as it began) with the complete destruction of Earth. Everyone is dead, which doesn’t leave much of an opening for Eoin to start the sixth book in the series. So how does Eoin bring the eternal pessimist Arthur Dent, his alien best friend Ford Prefect and the two headed Galactic President Zaphod Beelbebrox back from the dead? The 30th anniversary of Hitchhiker’s and the publication of Eoin’s new book will be celebrated across the world in a whole manner of ways and in different mediums - for information, visit the official web site at www.6of3.com. But NASA's tweets have definitely sent the anniversary celebrations from global to intergalactic. The petition against the British Home Office's ludicrous restrictions preventing non-EU artists and academics from participating the UK's cultural life - rules which could affect visiting comic artists to conventions in future - is getting closer to its target of 10,000 signatories. When the campaigners reach their target they will send a delegation to 10 Downing Street with the petition. "We're nearly there," says campaign co-ordinator Manick Govinda, but they need just a bit more help to make an impact. "The points based system which replaced the far more flexible work permits will be a year old on 27 November," explains Manick. "We want to hand the petition in by that date to mark that moment when our freedom to invite artists, writers, poets, dancers, musicians, academics and intellectuals - professionals and amateurs - were taken away from us." "The Home Office and the UK Border Authority need to get a sense of proportion," argues Manick. "Hundreds of community, amateur and cultural groups are being affected as well as big national arts institutions. "We need to send a loud message to the Home Office that these ludicrous regulations need to be seriously reviewed and reconsidered. "This petition has collected a huge breadth of voices from all walks of life, nationalities, political and religious persuasions." If you haven't signed it, please do so via this link. If each of you signing can persuade a friend, colleague or family member to sign the petition then the campaign has more than reached its target. Continuing our series of interviews with British comic convention organisers, for this sixth instalment Matthew Badham talks to comic creator Jimi Gherkin about the The Alternative Press Fair, which is being held annually in London. 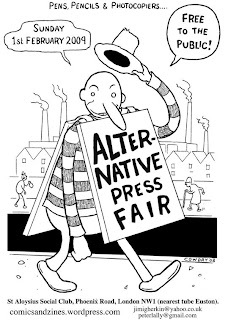 downthetubes: Please tell us about a little about the history of the Alternative Press Fair and how it's evolved over the years. Jimi: ‘Over the years’?! We (Peter Lally and myself) organised the first Alternative Press Fair (APF) in February 2009! Previous to that, though, I had organised a little comics and zine event above a pub called The Plough next to London's Cartoon Museum. We had 13 tables and two creators per table, so it was a small event. It was successful and people were asking, “What next?” Peter had helped a lot to organise that event and so we naturally started working together. We wanted to include different types of self-published material, so we dropped the ‘comics and zines’ reference. I had heard the name Alternative Press Expo and thought that alternative press was a term that was general enough for what we were trying to do. We were invited to have a table at Handmade and Bound (a book arts event at St Aloysius) to represent small press comics. We had about 15 artists on that one table! We liked the venue, so booked it for the APF in February. Then we had 26 tables with enough room for four creators per table. After that it got really exciting. Hundreds and hundreds of people came and we got tons of feedback from them. Some were offering us venues, others wanted us to organise events with them, but mostly people telling us they had a great time and loved the atmosphere. We’re trying to be as inclusive as possible and involve as many people as we can, so that makes for a friendly atmosphere. After that we thought we’d put together an anthology, then we had some ideas for events and so decided to do a festival as well. By this time, more and more people wanted to be involved and naturally certain people became part of what we’re doing. Now it’s myself, Peter Lally, Gareth Brookes and Saban Kazim (He designed the anthology. He’s a really talented graphic designer as well as a comic artist and stand-up comedian). Ceri May and Chris Bateson also became involved to help organise the poetry aspect of our events and helped us to select the poetry for the book. downthetubes: How is the Alternative Press Fair funded? By ticket sales, the exhibitors, a grant, some other means or a combination of these? Jimi: We are totally self-funding at the moment. At the APF events the exhibitors pay for their table space and this covers the hire of the venue and some other costs. For the other events we did as part of the Festival we really relied on the goodwill of venues to keep costs down. The Collaborama! for example took place in The Miller pub in London bridge. I’d never heard of this place before, but after the first APF the owner got in touch. He’d been to our event, enjoyed it and basically gave us the run of his pub for the whole day and night, for free! He doesn’t even usually open on a Saturday, but he paid his staff to cover the event and even gave free beer to the musicians! All because he believed in what we were doing. downthetubes: The APF host zine exhibitors as well as comics types. Please tell us about the mix and how that works out in terms of the type of material that punters can expect at your events. Jimi: We’re trying to represent the whole of the small press community and want as many parts of it to be involved as possible. We believe that we can learn a lot from each other. At our events people can expect to see a real mix of comix, zines, art books, illustration, poetry zines, radical literature and printmaking. The good thing, I think, about this mix is it keeps people fresh and brings new ideas to each of the scenes. For example, I’ve got a renewed interest in poetry, which is making me think about my writing. I’m also writing more, which is great. To add to that I think zinesters are thinking more about comix and illustration. Everyone understands each other a bit more, which is great. downthetubes: What are the APF's overall aims? Jimi: To encourage people to be creative and put their own ideas in print. This is really important as we feel being creative can be a really great thing for people, to be in control of their creativity. Another thing which is really important to us is developing an audience, getting people to understand what self-publishing is and why it’s so important. A lot of people don’t read comics, why? Is it because most comics don’t speak to most people? Can people really relate to a lot of stuff out there? I think generally the public haven’t really been exposed to the format. All they see is oversized, glossy mags full of adverts. When they see something A5 and photocopied, I don’t think they know what to make of it at first. One of our aims is to get the work out there as much as possible so that people can start to understand it. downthetubes: Who is the APF aimed at? What sort of punters do you hope to attract? Are you family-friendly? Jimi: Self-publishing is for everyone, so we want to include anyone who wants to be involved. As for punters, we’re trying to get in people who might not normally attend these kinds of events. Trying to put on events that might be interesting to families, or people who may have never heard of a zine before. Jimi: At the recent events we’ve had a real mixed bag of people coming along. At the first APF we had a write-up in the Guardian Guide. This brought a lot of people who were just interested in seeing what it was all about. People who had never been to a small press event before. 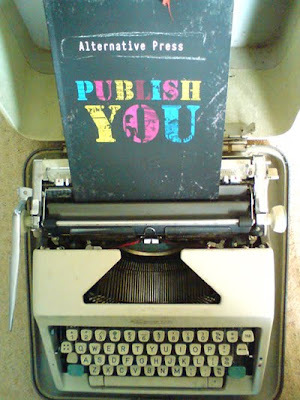 At the recent Alternative Press Festival, we ran five days of events, including the launch of our anthology book, Publish You. We varied the events and their venues so that they would be interesting to different groups. I think that worked out well. downthetubes: What lessons have you learned during your time running APF, in terms of its marketing and advertising? Jimi: Everything I know about this I have learnt in the last year organising these events. I don’t have a background in such things. But I’m persistent, and I believe in what we’re doing. But it’s a lot of work. I didn’t realise it would happen, but the festival and the book pretty much took over my life for five months! downthetubes: Do you use emerging technologies to spread the word about APF? Do you have a website or blog, or use email mailing lists? Jimi: Yes. There are two web sites at www.alternativepress.org.uk and http://comicsandzines.wordpress.com. We have a Facebook group and we always post up events there. Also a group on wemakezines.ning.com, so, yeah, we’re involved in that aspect of it. Mailing lists drive me nuts! Anyone got any tips for emailing 700+ people in one go? downthetubes: What are your thoughts on the small press comics scene in this country? Jimi: I’m still quite new to it really, still learning. I only put my first comic out in April 2008. It’s very exciting, as there’s a lot of really cool stuff out there. What really excites me are the books that aren’t afraid to try something a bit different. I love Gareth Brookes’ work, it’s so funny, and makes you think. Maartje Schalkx, I think is a very talented artist and tells a story in a really unique way. I love Mark Oliver’s stuff - really dream-like, with great artwork. You might not recognise these as comics, and I think that’s great, people playing with the format. There are some really amazing comics out there as well: the Bedsit Journal, Scott Jason Smith’s comics, Sina Shamsavari, Doctor Simpo, Paper Tiger, Banal Pig and Steve Tillotson’s work. I could go on! I think the small press scene in general is something for everyone and it’s a scene that is hard to define as everyone owns their little bit of it. I’d say the main thing we need to do here in the UK is to raise awareness of the scene and make comics and small press books more credible in the minds of the public at large. Make it more accessible. downthetubes: How much are the tickets for the APF? How did you arrive at that price? Please tell us about any concessions. Jimi: It has always been a free event for visitors and we aim to keep it that way in order to attract as many people as possible. downthetubes: How much are exhibitor tables for the APF? Again, how did you arrive at that figure? Jimi: Artists pay £5 for a part of a table. This amount covers the hire of the space and any other costs for that event, i.e. flyer printing etc. downthetubes: Do you run workshops/events/panels at the APF? Please tell us about those and how they are organised. Jimi: As part of the Alternative Press Festival recently we did lots of different things. At the book launch we did a short discussion about the small press/self-publishing scene, we also talked about our aims. The zine-friendly night was lots of communal stuff going on and we had a ‘zine wall’. Gareth Brookes made these giant books out of primed canvas, and we stuck them to the wall with pens hanging for people to take part. The Collaborama! was a whole day where we put together an 80-page zine! All the work for this zine was created by the people at the event, the visitors, children, musicians who were playing a gig upstairs and the exhibitors. The zine was then printed on the premises by the footprinters workers co-operative who came all the way down from Leeds with their risograph and it was collated by teams of people willing to help. It was finished in time to be able to sell it to the public who started coming to the pub just for a drink!! During the day Mark Pavey ran a screen-printing workshop upstairs and produced some cool Collaborama! posters, and Zarina Liew ran a 4koma comics workshop. We also showed some animations that people had sent us. As part of the Festival we had a spoken word night and during the evening people took part in a collaborative poetry project, which was lots of fun! downthetubes: As you've been kind enough to answer these questions, please fell free to big the APF up a bit. Tell us what you do well, what the APF's main attractions are and why our readers should attend the next one. Jimi: Well… it’s the scene I really want to ‘big up’, as well as all the amazing talent that’s out there, so please check out some of the links below or the names mentioned in this piece. The main attractions are those, again, of the scene that we are trying to represent, that has some great new artists, writers and creators. Also, just to let you know we're running another "zine friendly night" at the Foundry on Thursday 12th november, and will have a comics table at Handmade and Bound on November 1st. Plus, we're launching a new blog just before zine friendly, probably around mid October. downthetubes: Jimi, thank you very much for your time. An online and occasional print zine for the anti-authoritarian, DIY and punk communities. It offers news, analysis, interviews and articles about radical culture, be it music, protests, events, books, zines or comix. The Temple Issue 5 is now complete and available to download for free from the British comic creators group's forum. Compiled by John Kirkham, at 80 megs and over 160 pages it's the biggest issue yet, with class contributions inside from British talents such as Stuart Giddings, Simon Mackie, Adam Grose, Tony Suleri, Steve Tanner, Dave Evans, Malcolm Kirk and Paul Eldridge. Intended to be a platform for new talent, the issue also features a huge feature on rising publisher Insomnia Publications. A new batch of Commando issues from DC Thomson goes on sale tomorrow (8th October) in all good newsagents. As usual, the releases are a mix of new and reprint titles, with Issue 4235, "Desert Dispatches", a continuation of a war reporter series. Written by Norman Adams, Commando expert Vic Whittle tells us the issue had the working title "Lights, Camera... Action!". After finishing the first six adventures, the last being Issue 4050 ("Hold the Front Page", Norman had agreed with former Commando editor George Low to end the series, but artist Keith Page enjoyed the yarns so much current editor Calum Laird decided to bring them back. "Desert Despatches" the first of four new titles. Like the time the intrepid newsmen went to cover the war in the Sudan, and Digby had swapped his sketch pad and pencils for a new-fangled movie camera. Get ready to read their Desert Despatches! A crack British unit was on a secret mission in German-occupied Greece. This operation was top secret, NTK − Need To Know. Then disaster struck. The officer in charge was killed and the only other person who knew their objective lost his memory in the same attack. Out of the night they came − a gang of international terrorists intent on holding a whole North Sea oil rig and its crew to ransom. But they were not to have everything their own way. A call for help had gone out. The Royal Marines were on their way! As he lumbered along in his ancient Tiger Moth biplane, Eddie Sampson couldn’t wait to join his old friend, Mick Grady, who now commanded the mercenary air force flying for the government side in a bitter African civil war. • Ace media site Den of Geek has the latest pics from BBC TV's Sarah Jane Adventures here. Panini, publishers of Doctor Who Magazine, have just put out a great special on the show, featuring a full rundown of episodes and a terrific interview with its lead, Elisabeth Sladen, but sadly no comic strip. A missed opportunity, perhaps, although Sarah has featured in a few Marvel UK/Panini produced strips so even a reprint might have been fun. • Still, we doubt such concerns will worry many Doctor Who fans who are, as usual, divided over the latest change to their beloved show - a new logo. Melding a modern look with a nod to the Doctor Who styling of the 1960s, not everyone is happy about the TARDIS/Police Box-inspired branding. • Fancy a science fiction-inspired comedy night? Alex Fitch of Panel Borders has organised one in London. The Sci Fi London Comedy Night on 24th October is part of Sci-Fi London Oktoberfest, from 9.00 p.m staring Rob Deb from GNO, Sara Pascoe, Mould and Arrowsmith and many more. It's beaming into the Apollo Picadilly Cinema, more details here on Facebook. • The Edinburgh International Book Festival folks were kind enough to give Forbidden Planet International a copy of their recording of the Neil Gaiman and Ian Rankin event (chaired by Denise Mina) from this summer’s event, now converted to web friendly format and available to enjoy on the FPI blog. "There are a couple of times when you can hear laughter with no obvious joke," says Joe Gordon. "This is Neil and Ian in naughty schoolboy mode enjoying adding in phrases like balls and sphincter-tightening to see how the nice woman who was signing in BSL for the hearing impaired would cope..."
The latest issue of Egmont's TOXIC title, featuring humour strips by Lew Stringer and others, is on sale now. As well as strips and features, the issue comes with three free gifts: a Grabbing Hand, Star Wars Magnets and a Badge Making Kit. "Grabbing Hands" can of course, be used not only to pick your nose (as suggested by the TOXIC team): you could, for example, pretend to be a specially-adapted laboratory Dalek (chase people shouting "Experiment! Experiment!"). As part of Leeds "Light Night" event this month, the Thought Bubble Festival team have organised a special free event encouraging everyone to come along and draw to your heart's content. On Friday 9th October, Thought Bubble will take part in Light Night Leeds to encourage everyone to get creative. Light Night is a national programme of events covering the whole of the UK when, for one night, a city stays up so that its attractions and symbols are seen in a new light. Six major UK cities - as well as Leeds, the others are Kircaldy, Birmingham, Dundee, Nottingham and Perth - will offer their residents and visitors the opportunity to experience their city from a fresh perspective. Organisers say it's a chance for everyone to come together and celebrate the city, focusing on their shared culture, history and identity. Spectators get to see the unusual for free in a familiar environment and "lose themselves" in the city, which is transformed into a stage for the night. As part of Leeds Light Night event, Thought Bubble are holding a live art installation at Travelling Man Leeds on their store front window. Lees residents and visitors are invited to pop along and draw something, and there will also be freebies, snacks and drinks for all. The finished art will be displayed at the Travelling Man Leeds Coffee Bar. • Draw, Draw Draw! is on Friday 9th October, 5.30pm to 10pm, FREE. Travelling Man Leeds, 32 Central Rd, LS1 6DE, 0113 2436461. Top audio adventure company Big Finish, perhaps best known for their Doctor Who productions, has just made a long-awaited return to the 2000AD universe with a brand new series of adventures in crime and space. Judge Dredd: Crime Chronicles finds the iconic lawman of Mega City One starring in four new stories where he faces off against foes old and new and, for the final story, partners up with a fellow Judge played by Doctor Who’s Louise Jameson, who played companion Leela in the 1970s. Officially licensed by Rebellion, each story is a dramatic reading, with full sound design and a specially drawn cover by 2000 AD artist Cliff Robinson, and features Toby Longworth as Judge Dredd. The series begins with Stranger Than Truth, written by former 2000AD editor David Bishop and told by Brit-Cit academic, Eliza Blunt (Helen Kay). Captured and imprisoned by Judge Dredd, author Truman Kaput has spent years in the Mega City One iso-cubes, his work banned. His crime: writing lurid detective novels in which the ficticious Slick Dickens repeatedly outwits the cowardly bully, Judge Dredd. Now a new Truman Kaput novel is being serialised, and each chapter predicts an imminent murder with chilling accuracy. Has Slick Dickens escaped the page to commit real crimes in Mega-City One? Is a serial killer using the chapters as templates for their crime? Where does fiction end and the truth start? And, perhaps most importantly: can Dredd stop the plot before his nemesis fulfils the finale of Slick Dickens: I Killed Judge Dredd? The third tale, to be released in December, The Devil’s Playground by Jonathan Clements, is narrated by Wendy Plainfolk (Gemma Wardle) and finds Judge Dredd hunting a killer on the loose, his only lead a girl who's never seen the sky or the streets. Raised in a religious commune, locked in a closed farming habitat in the heart of the city, Wendy Plainfolk knows nothing of the temptations and dangers of Dredd's world. But she is the only link to a double homicide in a place she calls the Devil's Playground: Mega-City One. January 2010 see Louise Jameson narrate James Swallow’s Double Zero in the guise of Judge Anderson. On the Mills-Wagner scale of psychic potentiality, the Double Zero rating is ranked as the lowest possible level of human telepathic receptability and/or psionic ability. Electronic Arts Inc. has that it has signed a deal with IDW Publishing to expand two of its intellectual properties, Army of Two and Dragon Age, into comics under a new EA Comics imprint with IDW beginning in January - and one will be written by top British creator Peter Milligan. EA and IDW will launch monthly, ongoing series for both Army of Two and Dragon Age, both in print and as digital versions released for iPhone and iPod Touch and other emerging digital platforms. Written by veteran comic book writer Peter Milligan (whose credits include 2000AD, X-Men, Batman and Hellblazer), Army of Two is being published as a comic starting in January 2010. Rising star Chester Ocampo is the cover artist while the interior artist/penciler, Dexter Soy, is described as a ‘hot newcomer’ on the comic scene. Soy’s work suggests influences from well-known comic artists such as Whilce Portacio and Leinil Francis Yu. The first story arc, “Across the Border,” follows ex-Army Rangers Salem and Rios as they form their own Private Military Corporation: Trans World Operations. The story of the comic follow the events of the first Army of Two game but takes place before the deadly invasion of Shanghai by The 40th Day initiative in the videogame sequel. In the comic, Salem and Rios get more than they bargained for as they are unexpectedly caught in a brewing war between the Mexican Army, drug cartels, and The Maras – one of the most powerful street gangs in Mexico. Inspired by the highly-anticipated BioWare RPG, Dragon Age: Origins, the Dragon Age comic book series will be written by award-winning science fiction and fantasy writer Orson Scott Card (creator of Ender’s Game and the Seventh Son saga). The cover artist is the critically acclaimed Humberto Ramos. Story details and the interior artist are expected to be announced shortly. “We’ve seen an increasing number of video game tie-ins with comics over the last few years, explained said Mike Quigley, Group Vice President, Global Marketing, EA Games Label, no doubt referring to titles such as Gears of War, drawn by another top British talent, Liam Sharp. "This marks another step in our strategy for extending EA’s wholly-owned game properties to new media. Under terms of the agreement, EA will fund and manage the creative aspect of the comic book series, while IDW will be responsible for printing and distribution. IDW is the leader in digital comic book distribution and the nation’s third largest comic book publisher overall. • To sign up for the EA Comics mailing list, register at: www.eacomics.com. The site will feature complete information on all the EA comic book series, as well as unique “behind the scenes” content, news, blogs and artwork, plus weekly content updates to keep audiences apprised of the latest developments on current and upcoming projects. Brilliant British cartoonists site Bloghorn draws our attention to two political cartoon exhibitions featuring cartoons lampooning Conservative leader David Cameron open in London next week, at the Chris Beetles Gallery and the Political Cartoon Gallery. Peter Brookes: The Best of Times, is at the Chris Beetles Gallery from Monday 12th October until the end of the month. It features more than 100 of Brookes’s most recent cartoons from The Times will be on display and signed copies of the book accompanying the show are available from the gallery. Drawings by Brookes also feature in Cameron in Caricature, an exhibition of 60 cartoons charting the fortunes of David Cameron since he became Leader of the Conservative Party in December 2005, at the Political Cartoon Gallery from next Tuesday (13th October) until 24th December. Due to his upbringing and education, Cameron is often portrayed as a toff and is portrayed by Martin Rowson of the Guardian as Little Lord Fauntleroy. After Cameron called for greater transparency in the publication of both Commons' expenses and councils' expenditure, Steve Bell, also of the Guardian, now draws him as Dave the Jellyfish. As well as cartoons by Bell and Rowson, there are also cartoons of Cameron by Brookes and Morten Morland of The Times, Dave Brown and Peter Schrank of The Independent, Ingram Pinn of the Financial Times, and Andy Davey of The Sun, among many other leading cartoonists. Found on Vimeo by Paul Eldridge, this is an animation trailer for ABC Warriors, created by Firestep with the full cooperation of Rebellion Games, the Rights Holders to the 2000AD catalogue. Then, Jason Kingsley, CEO and creative director of Rebellion said he was delighted to be working with Firestep. "Whilst we are at the top of our field in developing computer games and in comics publishing, Impossible and Firestep are at the top of theirs in TV production where they have an enviable level of success, expertise and experience. The innovative concept of a full motion comic aims to bring 2000AD to a broader, younger audience whilst still engaging its core fan base. “We have an enviable creative challenge ahead of us in translating the extraordinarily diverse visual and narrative worlds of the 2000AD originals into animation," said Firestep’s Steve Maher. There's no indication which other characters are being developed, although both Judge Dredd and Nemesis the Warlock were mentioned in the initial release. So that was The British International Comics Show (BICs). It was my first time and I have to say that I had a lot of fun, and that, if time and resources allow it, I'll be back next year. That isn't just my view: I had a look at Twitter this morning and the consensus seems to be that BICs was a success. Lots of nice comments. However, when I rolled up on Saturday, things weren't looking good. The launch party, on Friday, was apparently a bit of a damp squib, with one attendee describing it to me as being a cross between a "school disco and a wedding reception." In the interests of balanced and fair reporting, I then spent the day trying to find someone who had enjoyed the party, but after questioning 20-plus people, I gave up. No one that I could find seemed to have a good word to say about it. One pro' that I spoke to suggested that it was down to the venue, which they described as the sort of place you go to when ‘you're not old enough to get into a proper club.' Something for the organisers to look at for next year's bash, particularly as previous years' launches have, or so I've heard, been roaring successes. The other slight issue that some people had with the show (mainly some of the indie crowd) was the table prices. Tables for exhibitors were going for £120, or £90 if you were a previous exhibitor who re-booked ahead. (Dealers and publishers were £160). I know that this was the deciding factor for some cartoonists who didn't attend and exhibit, and I have to say that the indie comics' presence did seem a little thin on the ground. Still, there were some enterprising souls that had come up with strategies to minimise their costs. The Manchester Comix Collective (MCC) had five people manning their stall and were showcasing the work of (I think) 14 cartoonists, all of whom contributed to the cost of exhibiting. Splitting the costs in this way seems a sensible option if you're a struggling cartoonist and the MCC certainly weren't the only indie types to adopt this strategy. Anyway, enough moaning about table costs and the launch party. These are relatively minor quibbles (okay, a crap launch party is a bit of a big deal, but BICs seemed to recover from it well) about what was, for the most part, a fantastic show. So what made it good? The panels, for a start. I don't usually attend many panels at cons and I think I've been missing a trick. On Sunday morning, I made a point of sauntering along to see Sarah McIntyre interview manga artist Michiru Morikawa, which was just amazing. Part of this was down to Sarah, who was a great interviewer, and Michiru, who was interesting, humble and very charming, and part of it was down to the venue's excellent lecture theatre (the audio-visual facilities enabled Sarah to give us a really "up-close-and-personal" tour of Michiru's work, picking out relevant panels and pages and discussing them as the interview proceeded, and, along with some great acoustics, meant that both interviewer and interviewee were audible at all times). Add to this a surprise cameo appearance and impromptu discussion of Michiru's new graphic novel, Buskers by Jeymes Samuel, the man whose screenplay it was adapted from, and you've got one of my personal highlights of the whole weekend. After the interview, I spotted Jamie and Tom, two members of the Manchester Comix Collective, who are self-confessed "panel junkies". They'd been to almost every one on the Saturday and were there on Sunday ready to attend most of that day's panels as well. They were having a great time and reckoned that this year BICs had raised its game in this department. Others seemed to agree. The Saturday night chatter when we went out to eat was highly positive about the show in general (unless the launch party was mentioned; I'm sorry, I really am trying to stop banging on about that) and included mention of various panels. Specifically, Howard Chaykin was apparently "hilarous", Andy Diggle and Paul Cornell were "entertaining and had positive and sensible ideas about the future of comics" on the Marvel comics panel and Bryan Talbot's talk about his new graphic novel, Grandville was "interesting and insightful" (but, you know, quelle surprise: it's Bryan Talbot). But the show wasn't just about panels (although, if it had been, I think it would still have been value for money). It was about mingling, chatting about and buying comics, and generally going geek for the weekend ("I'm with my peers, I can dress as Zod. Hooray!") Cue various fanboys and girls wandering around dressed as stormtroopers, The Goddam Batman, judges, anime characters and the David Tennant Doctor, which was all good fun (The Dalek that was gliding about wasn't good fun. He was a massive pain in the arse, because he was slow and created people jams wherever he went. But, you know, ultimate evil and all that, so I suppose it's kind of in his modus operandi to annoy people). Less good fun were the guys dressed as the Joker's henchmen from Dark Knight. Because, when you think about it, they were just two guys in dirty suits wearing clown masks and carrying worryingly realistic facsimile automatic pistols. Considering that shows like BICs are trying to be family-friendly, it seemed a massive error of judgement on the part of those two fanboys (not on the part of the show's organisers, who, I assume, don't have any control over the costumes that attendees wear). There was a really sweet moment when I spotted a dad taking a photo of his obviously elated young daughter posing with the Tennant Doctor and another fan dressed as Rose. I can't think of anyone, though, in their right mind, taking a similar photo of their child posing with the Joker and his two goons, who were just flippin' [expletive diluted - Ed] scary. Fortunately, that slight sour note of fan boy misjudgement didn't spoil BICs for me. I think the organisers should be commended and I hope that the show will be back again next year, and in subsequent years. I have to admit that I'd heard some negative things about BICs before attending and wasn't actually looking forward to it (but had to go, for work purposes). I'm glad to say, however, that my fears were unfounded. Well done to all the organisers and volunteers who made it happen. Damn fine show, chaps. Damn fine show. Oh, and I almost forgot to say: one of my highlights of BICs wasn't comic-related. Both days I took a trip to the Warehouse Café (just round the corner from the venue and not too far from the city centre) and was very impressed by their friendly service, reasonably-priced and tasty food, and chilled, laid-back ambience. If I go to BICs next year, then I'll definitely pop back to the Warehouse and, if you're there, you should too. Veggies and vegans especially note: it's an exclusively veggie/vegan café. "Thought comic books were just for kids or all about caped crusaders and naughty schoolboys? Then the UK’s largest comic industry convention in Birmingham this weekend will make you think again..."
"Aside from feeling pretty tired driving there and back both days I throughly enjoyed myself. There seemed to be less 'professional' creators this year but tbh, the show didn't really miss as it meant punters had more spare cash to buy small press/independent comics...."
"BICS was fun, but a slightly more low-key affair (I felt) than the last time I went (2007), probably due to the dark times we live in, etc...."
"Bics is over for another year and it was awesome. I sold lots of stuff, made lots of money and met lots of awesome people. My superhero paintings went down an absolute storm and I think I'm going to have commissions coming out of my ears, which isn't a bad thing!" "I had a great time, tiring sure, but equally inspiring and energising..."
"We managed to shift some copies of Moronoid which felt good, so we celebrated in style on Saturday night, stumbling upon the coolest and quirkiest little club/bar I've been in in years which no doubt we'll never find again." "As ever, it was really nice to catch up with so many comic friends, old and new. The biggest surprise of the weekend was meeting Alex Bardy from my old fanzine days..."
"As predicted I spent a small fortune on books. I'll mention in more detail when I've read them but the pick of the crop thus far has to be Paul Rainey's latest. Those of you familiar with the story (well worth catching up with if you aren't already) of There's no time like the present will be interested to know that Kelly makes a return. I tried to winkle the ending out of Paul when buying my copies at his table but no dice." "There was video taken, so expect it on Youtube, but we had a blast. The audience did as well and several times over the weekend we were told it was a 'highlight panel' which just shows that people should get out more. Highlights included making the Pink Ranger answer our questions in the form of interpretive dance, Dan [Boultwood] having to re-press stud Green Arrow's crotchpiece repeatedly, Spider-Man doing 'groin stretches' for the audience and the Joker and Harley for well, being the Joker and Harley. Oh, and the small boy who, dressed as Anakin Skywalker in Pod race kit decided he'd rather be on a speeder bike..."
"I think my interview of Michiru Morikawa went well. Something very cool happened in the middle of her talk; she was saying she was sad she hadn't been able to meet any of her co-creators, other than via e-mail, and suddenly one of them, Jeymes Samuel said something like, 'Hey, I'm here! ', and there was a big happy first meeting! Jeymes was able to talk about the film being made, and made Michiru glow with his effusive praise of her work. That was fun!" "Vendredi, je quitte Londres pour Birmingham où se tient le British International Comics Show, une des manifestations culturelles majeures en bande dessinée en Grande-Bretagne. Cette année, le festival accueille entre autres Rufus Dayglo, Tony Lee et Bryan Talbot. Ce que j'aime de ce festival, c'est que les organisateurs ne sont pas gênés de mettre en valeur et en avant-plan les artistes britanniques et ceux qui résident tout près de Birmingham et de Londres, considérant ceux-ci comme la valeur principale de leur événement..."
"The party was full of familiar faces. It was great to see their faces. Hunt, Laura, the Goodmans, Bryan. Dozens of faces. Their mouths opening and closing. The only drawback was that none of us could hear what the other was trying to say because there was a DJ playing very loudly. If there's one thing comic fans don't need it's a dance floor. Have you seen comic fans? Urgh, the very thought of any of them dancing. All those grodey t-shirts, beards, pony tails and leather jackets being shaken in public is quite terrifying..."
"I’ve spent a lovely afternoon making monsters with my son and Sarah McIntyre, the illustrator of the most revolting monster book I’ve ever read. It was great fun...."
"I had a blast at the BICS festival in Birmingham over the weekend, catching up with lots of friends, meeting some great new people and selling loads of comics. Septic Isle and BritForce were my top sellers, suggesting punters are more interested in a meaty graphic novel-length read these days than in flimsier pamphlet-style comics..."
"We sold our last novel about 3.00pm Sunday, to a podcaster who reviews comics, so we'll post links to that review when it comes out. Then at 4.00pm we realised the event had pretty much run its course for everyone, and headed back to Essex, feeling pretty damned pleased with ourselves. Now we're looking forward to Komiket in November and the Bristol show in May 2010." "Hi to those of you whom we met in Birmingham, both old and new fans alike! We had the best weekend we'd ever had at a convention, with huge sales of the new trade paperback collection of issues 1-6. If you were there but weren't able to buy it at the time, go take a look in the Harker online store, where you can buy every issue of Harker to date, and the new collected edition too." "Some tips to make sure your outing at a comics convention is an enjoyable one: Don’t be ill or under the weather. Not only will the headache and general misery put a damper on your day, you’ll only infect everyone; ... Don’t pack your bag so full of books it’s too heavy to lift it onto or off the train. This will be very annoying and will get you nasty looks at Birmingham New Street station. And that is not a good place to be getting nasty looks." A new collection of Striker stories has just been published online via MyEbook.com. "Dead Man Walking", set in Haiti, was a fan favourite, but creator Pete Nash warns that it should not to be read by the politically correct! Pages will be added regularly. Celebrating the first anniversary of the Credit Crunch, Alex, the investment banker we all love to hate, whose strip adventures now appear in the Telegraph, has been brought to new life on the iPhone and iPod touch, in an "all-new" Tapisodes format. Alex is a much-loved, occasionally hated, cartoon strip by Charles Peattie and Russell Taylor, which first appeared in the short-lived London Daily News in 1987, before moving to The Independent later that year and then to the Daily Telegraph in 1992. The strip is also collected annually. Billed as the "first (proper) interactive mobile motion comic" for the Apple platform - a blending of comics, animation and tap interaction - 20 animated and interactive Alex strips, each themed around the market crisis, are being rolled out daily, downloaded straight into the Alex app. “We are excited to bring a new way of experiencing comic books and animation to the world’s most trendsetting mobile platform," says Jörg Tittel of Tapisodes. "We hope to please the legions of Alex fans and introduce thousands more." Alex - Credit Crunch Special will offer a new episode every business day from today until 23rd October, with each episode downloaded straight into the application at no additional cost. You can choose to receive a “push notification” each time a new episode is available, or browse intuitive thumbnails for downloaded, available and upcoming episodes. Alex also comes with social networking integration, so you can do what bankers do best: tell friends about your favourite Tapisodes, all in the safety of your iPhone and out of the nosy IT department’s reach. Alex is only the first of a series of Tapisodes mobile comics. With a patent pending on the technology, the producers have been working with other high profile brands and franchises to create new content. “We have always embraced other entertainment mediums and therefore are very excited about the opportunities for games companies in interactive storytelling and film," explains Paul Farley, CEO of mobile game developer Tag Games. Tapisodes and Tag Games were brought together through the Play Together program Creative Industry Switch created by TIGA (the trade body which represents the UK videogames industry) and NESTA (the National Endowment for Science, Technology and the Arts). Creative Industry Switch is designed to foster communication and collaboration between the videogames industry and other UK creative industries such as film, TV, radio and animation. “This is exactly the sort of commercial collaboration between video games developers and other complementary media providers that we had hoped the Play Together initiative would achieve," argues Jackie McKenzie of NESTA. • The ALEX iPhone application is available for download from the Apple iTunes App Store at a cost of £0.59, with 20 animated, interactive tapisodes gradually made available for download - straight into the app and at no extra cost. Recession proof, it does however requires the iPhone 3.0 Software Update or later. A not-for-profit second Mistycomic.co.uk Special, inspired by the 1970s British girls comic, Misty, is now available from the official Misty Comic web site. Not to be confused with the recent Egmont Misty Classic Comic on sale now in WH Smiths (see news story), this new anthology full of new and original artwork and stories comes in at a bumper 80 pages wrapped in a stunning cover by Interzone illustrator and and former 2000AD artists SMS, plus a free "Bella" poster from original Misty comic artist John Armstrong (who is also interviewed in the magazine), the Special includes an illustration by the brilliant David Roach (from an unpublished painting by Shirley Bellwood) plus comic strips inspired by Misty, including "Mint Condition", written and drawn by SMS; "Dreamcatching", written by Amaliia, illustrated by Ex Astris artist Mike Nicoll; "The Eyes", written by Colin Noble with art by Terry Wiley; "Time School - Teacher’s Pet! ", written by John Freeman, again with art by Mike Nicoll. Along with more strips there are also poems and stories from a host of other creators including artists J P Sewell, Terry Wiley, Douglas Noble, Carl Lavin, Johnny McMonagle and James Battersby and writers Briony Coote and Charles Ellis. "I want to thank all the contributors for making this possible (again)," comments editor Chris Lillyman, who has been assembling this Special for the past three years. Alternative Press are hosting another awesome evening of Zines, comix, book arts and poetry at their second Zine Friendly event at the Foundry in London in November, in order to promote the new project, the Zine Friendly Blog. A resource for Self Publishers far and wide, the site will be listing venues, promoters, stockists and events that are all "Zine Friendly"! To celebrate this the AP team are inviting small pressers everywhere to come down and promote their own work for free. "All we are asking is that people donate what they can, even a zine or two, to help Alternative Press to keep promoting the scene," says co-organizer Jimi Gherkin. "Also, we are inviting some zine distributors to represent as much of what is going on in the scene as we can." There will be food and other fun stuff, too. "We'll be having a cake sale with free tea, knitting circle, free blank zines for you to use and a poetry workshop followed by some performances and a short open mic." It all sounds like great fun and past events have been well received, so if you're in London, give it a go. The long running series of articles on Great British Comics Artists by David Ashford and Norman Wright in Book and Magazine Collector has reached part 32. This issue's subject is Alan Philpott. Philpott was the artist who created Robot Archie for Lion in 1952. Previously he had worked on the A Classic In Pictures series which was a British attempt recreating the American Classics Illustrated. He also worked on Swift and the Air Ace, War and Battle Picture Libraries before moving over to DC Thomson. There he worked on Victor, Hornet, Hotspur, Wizard and Commando. Indeed his last published comics work was the cover of Commando issue 1978, Winger Fury, published in March 1986. The article runs to 13 pages plus 5 pages of a very detailed bibliography. 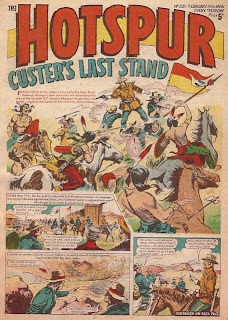 The article includes the front and back covers for Hotspur 331 from 1966 which tells the story of Custer's Last Stand and Victor 91 from 1962 which tells the story of the Dam Busters. Each of these four comic pages get a single colour magazine page each and so are easily readable. 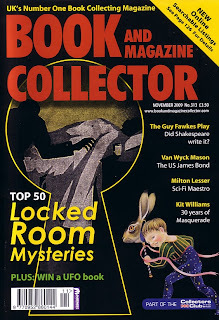 Book and Magazine Collector issue 313 is available for £3.50 from WH Smiths and Easons, or from the B&MC website.